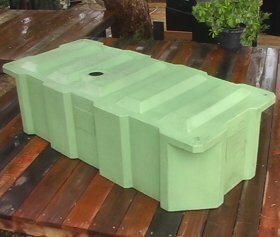 Dynaplas manufacture quality rainwater tanks, from crack resistant, U.V. stabilised, food grade polyethylene. Here at Dynaplas we have been rotomoulding since 1987. Dynaplas can provide water tank delivery to all Australian States. To Brisbane and Melb. we can carry 26 large tanks in one load. Made from U.V. stabilised polyethylene, food grade material. Includes brass outlet, tap and leaf/insect screen.